119 Marlborough is located on the north side of Marlborough, between Clarendon and Dartmouth, with 117 Marlborough to the east and 121 Marlborough to the west. 119 Marlborough was designed by architect George F. Meacham and built ca. 1873 by builder James W. Tobey for speculative sale. He and his wife, Lydia C. (Morrill) Tobey, lived on Blue Hill Avenue. James Tobey purchased the land for 119 Marlborough on March 19, 1873, from Edwin H. Abbot, who had purchased it from the Commonwealth of Massachusetts on September 9, 1867. 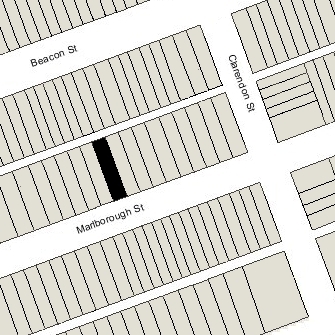 On July 7, 1873, James Tobey purchased a six inch strip from James Standish under the party wall with 117 Marlborough. Click here for an index to the deeds for 119 Marlborough. On May 6, 1874, 119 Marlborough was purchased from James Tobey by attorney Edward Sprague Rand. He and his wife, Elizabeth (Arnold) Rand, made it their home. They previously had lived at the Hotel Pelham (southwest corner of Tremont and Boylston). They continued to live at 119 Marlborough during the 1877-1878 winter season, but moved thereafter. By 1880, they were living at 39 Fort Avenue in Roxbury. He and his wife were killed on January 18, 1884, in the wreck of the steamer City of Columbus off Gay’s Head at Martha’s Vineyard. Their son, Rev. Charles A. Rand, his wife, Jennie (Wing) Rand, and their daughter, Frances M. Rand, also were killed. On December 28, 1878, 119 Marlborough was acquired from Edward Rand by Thomas Wigglesworth, a shipping merchant in the East India and Calcutta trade. He was unmarried and lived at 1 Park. Thomas Wigglesworth held a mortgage on 119 Marlborough and several other properties owned by Edward Rand, who released his interest in the properties, possibly in lieu of foreclosure. By the 1879-1880 winter season, 119 Marlborough was the home of Dr. George W. Rhodes, a physician, and his wife, Juliette (Smith) Hall Rhodes. He also maintained his medical office there. They previously had lived in Jamaica Plain. They continued to live at 119 Marlborough during the 1880-1881 winter season, but moved thereafter to 127 West Chester Park. On May 10, 1881, 119 Marlborough was acquired from Thomas Wigglesworth by Susan Christina (Parker) Tenney, the wife of Nathaniel Fisher Tenney. They previously had lived at 30 Worcester Square. Nathaniel Tenney was a boot and shoe merchant and also served as president of the Winthrop National Bank. In 1885, their son-in-law and daughter, Charles and Alice (Tenney) Bullard, lived with them. Charles Bullard was a coffee and spice merchant. They moved soon thereafter to Francis Street in the Longwood district of Brookline. The Tenneys continued to live at 119 Marlborough until shortly before his death in May of 1891. On March 5, 1891, 119 Marlborough was acquired from Susan Tenney by Nancy Hill (Newhall) Valpey, the wife of shoe manufacturer Henry R. Valpey. They previously had lived in Leominster. Nancy Valpey’s sister, Harriet Maria (Newhall) Warner, the widow of Oliver Warner, lived with them. 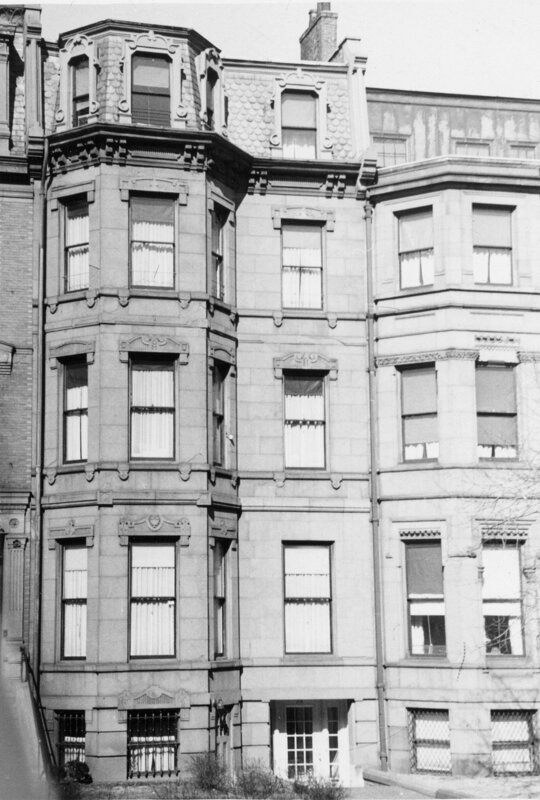 They continued to live at 119 Marlborough during the 1892-1893 season, but moved thereafter to Brookline. On March 10, 1893, 119 Marlborough was acquired from Nancy Valpey by real estate dealer George Loud Clark. He and his wife, Helen Augusta (Rothwell) Clark, made it their home. They had lived at the Hotel Vendôme in 1892. George Clark’s father, John Morehead Clark, lived with them until his death in June of 1902. John M. Clark had been sheriff of Suffolk County for 28 years. George Clark died in March of 1912, and Helen Clark moved soon thereafter to 43 Ivy. On Mary 23, 1912, 119 Marlborough was purchased from George Clark’s estate by Julia Hurd (Hutchins) Crocker, the wife of attorney George Glover Crocker, Jr. They previously had lived at 439 Marlborough. They also maintained a home in Cohasset. They continued to live at 119 Marlborough during the 1920-1921 winter season, but had moved to Milton by 1923. 119 Marlborough was not listed in the 1922 Blue Book. On March 3, 1922, 119 Marlborough was acquired from Julia Crocker by Harriet Sayles (Jaques) Motley, the wife of investment banker Edward Motley. They previously had lived at 413 Beacon. They continued to live at 119 Marlborough during the 1923-1924 winter season, after which the made their home in Concord. On July 2, 1924, 119 Marlborough was purchased from Harriet Motley by Thomas Jefferson Newbold and his wife, Katherine (Hubbard) Newbold. They previously had lived at 210 Beacon. In July of 1924, they applied for (and subsequently received) permission to remodel the house, including lowering the front entrance to street level. The remodeling was designed by architect Charles G. Loring. They also maintained a home in Beverly Farms. T. Jefferson Newbold grew up in Hyde Park, New York, where his parents were next door neighbors of Franklin and Eleanor Roosevelt. He began his business career as a selling agent for the International Cotton Mills. He subsequently became an investment banker and by 1924 was treasurer of the Red Star Manufacturing Company, makers of house furnishing goods. He subsequently was president of an electrical engineering firm. T. Jefferson Newbold died in July of 1939. At the time of his death, Eleanor Roosevelt described him as “one of our oldest friends.” Katherine Newbold continued to live at 119 Marlborough until about 1951. On July 17, 1953, 119 Marlborough was purchased from Katherine Newbold by Hyman Goodman. Later that month, he applied for (and subsequently received) permission to convert the property from a single-family dwelling into ten apartments. On April 1, 1959, 119 Marlborough was acquired from Hyman Goodman by John V. Kunigenas. On June 29, 1973, it was acquired from him by Anthony P. Baker, and on July 7, 1976, John Kunigenas foreclosed on a mortgage given by Anthony Baker and re-possessed the property. On August 22, 1979, 119 Marlborough was purchased from John Kunigenas by the Broderick Development Corporation (Frank H. McCourt, Jr., president). On the same day, it also purchased 136 Beacon, 138 Beacon, 169 Beacon, and 171 Beacon. On the same day, Broderick Development transferred the property to the Broderick Investment Corporation, and it sold the property to John Forger, as an individual, and the Broderick Realty Corporation (Frank H. McCourt, president), jointly doing business as 119 Marlborough Street Associates. 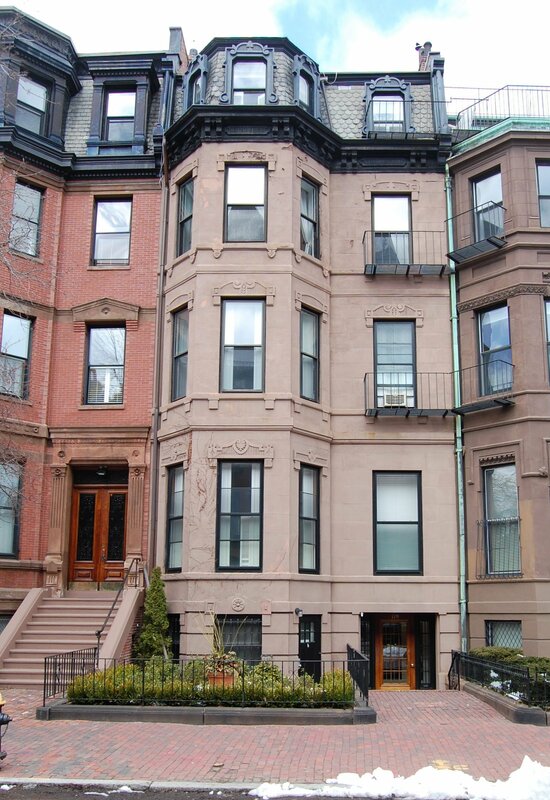 On January 2, 1980, 119 Marlborough Street Associates converted 119 Marlborough into ten condominium units, the 119 Marlborough Street Condominium.